Located on Interstate 40, it is logical that a “Welcome to Amarillo” sign in front of Hoffbrau would greet a number of out-of-town visitors to this popular steak restaurant. Perhaps the somewhat legendary Big Texan Steak Ranch at the opposite end of the city has made Amarillo well known for its steaks, but as you drive through the surrounding cattle country it becomes very obvious that this is one of the region’s mainstays. I went to Hoffbrau with some reservation, thinking that it was part of a chain that started in Austin and spread throughout the state. Actually the employees confirmed that it is not related to the Austin Hoffbrau at all, but does have three locations in the Fort Worth area. 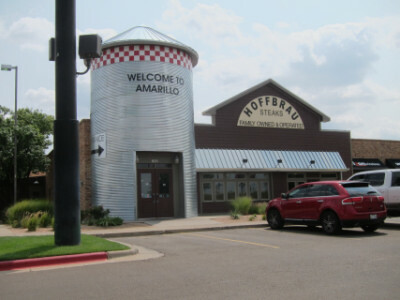 Amarillo and Fort Worth could have equal claim to being the steak capital of Texas, and even if Hoffbrau is technically a chain, the food at the Amarillo location seemed to be locally sourced and exhibited the characteristics of a local restaurant. I will mention that although I was there during the lunch hour (lunch is served until 4:00 pm), the lunch menu mainly consists of hamburgers and other sandwiches. Steak dinners such as the one I ordered are on the dinner menu, and these come with rolls and your choice of soup or salad (the baked potato and dessert were extra). 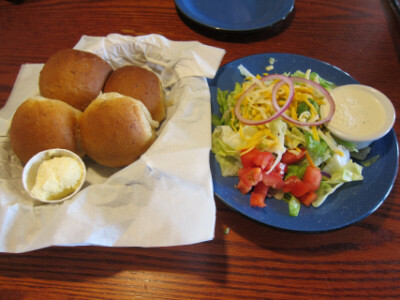 The Salad which came with the steak dinner was very fresh, and I thought the ranch dressing was excellent. They did a good job with the rolls as well. Soup can be ordered instead of the salad if you prefer. The Filet delivered everything I was expecting–flavor and good quality. Hoffbrau makes no claim that the steak is special in terms of being grass fed or anything like that. As someone who is pretty particular about steaks, though, I was very satisfied with it and would not be surprised if it were locally raised on their own ranch or came from their known trusted sources. It reminded me of the steaks I had while growing up–something that is not common enough in restaurants these days. The Baked Potato was also very good, and the toppings which included “everything” met my criteria for an enjoyable potato. The menu includes a choice of several sides, but I was happy with the potato and would stick with this on any future visits. 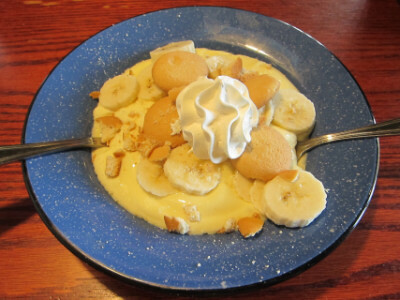 The Banana Pudding is excellent but comes in a very large portion, and I think is meant to be shared. In case some are thinking of eating all of it by themselves, I must give a stern warning much like the old man in the Monty Python and the Holy Grail movie who was advising the knights about a particularly mean-tempered rabbit who they thought could be easily handled by just one of them (in other words, they are likely to fail). The restaurant also has peach cobbler and chocolate cake, which I assume come in equally large portions. Although all steak restaurants are expensive, Hoffbrau is one that I would call moderately priced. The best part, though, was that the meat was also very good and the seasoning was excellent. The side dishes made the meal even better–the salad and potato were both very good, and I especially enjoyed the potato. 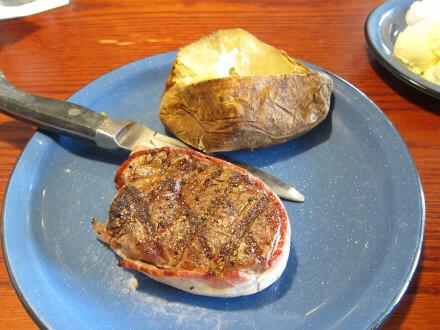 When choosing a steak restaurant in Amarillo it is important to read the reviews on Yelp and other web sites, because not all of the restaurants here are as good as one would expect for a place in cattle country. I thought Hoffbrau was a very good choice.